On Sunday, the National Prosecuting Authority announced that murder charges against 270 miners being held in the North West were being dropped. Miners who last week were provisionally charged in the Ga-Rankuwa Magistrate’s Court with the murder of 34 of their comrades – shot and killed by police at Lonmin’s platinum mine in Marikana – would be freed. As the NPA dropped the bombshell the world had been petitioning for, there was plenty of back-pedaling and damage control. Things were going fairly well, until the man who pressed the charges got up to cover his back. By MANDY DE WAAL. It must have been a hell of a week for Advocate Johan Smit, Director of Public Prosecutions for the North West and the man who took the final decision to charge 270 Marikana miners with the murder and attempted murder of their comrades. President Jacob Zuma was tight-lipped about the murder charges at the Socialist International congress held in Cape Town on Friday, the same day that attorneys for the miners sent our president a letter demanding the release of the accused miners by 13h00 on Sunday 02 September 2012, if he didn’t want to face an urgent high court action compelling him to do so. By Friday 31 August 2012, Smit had a report on the desk of acting national director of public prosecutions, advocate Nomgcobo Jiba, explaining the rationale of the charge; by Saturday 01 September Jiba was reviewing the charges with her top team, after she had “picked up the various concerns from various parties reported in the media”. By Sunday 02 September, Smit was in his car, driving down to Pretoria from the North West for a media briefing. At the briefing he knew he’d have to explain that ‘absurd’ charge to a large media contingent. In said media briefing, thick with dulcet tones, carefully worded condolences, and measured statements about how seriously the NPA took the matter, Jiba dropped the not-so-unexpected bombshell. The Marikana miners accused of public violence, along with the murder of their comrades shot dead by police under a ‘common purpose’ legal vehicle, would be freed, the charges against them dropped. “The decision and pronouncement on final charges to be preferred against any persons involved will only be made once all investigations have been completed,” Jiba said at government’s communication head offices in Pretoria. Then she added: “The murder charge against the current 270 suspects, which was provisional anyway, will be formally withdrawn provisionally in court on their next court appearance. Other provisional charges will remain.” The other charges include attempted murder in relation to the 78 protestors shot by police, and public violence. 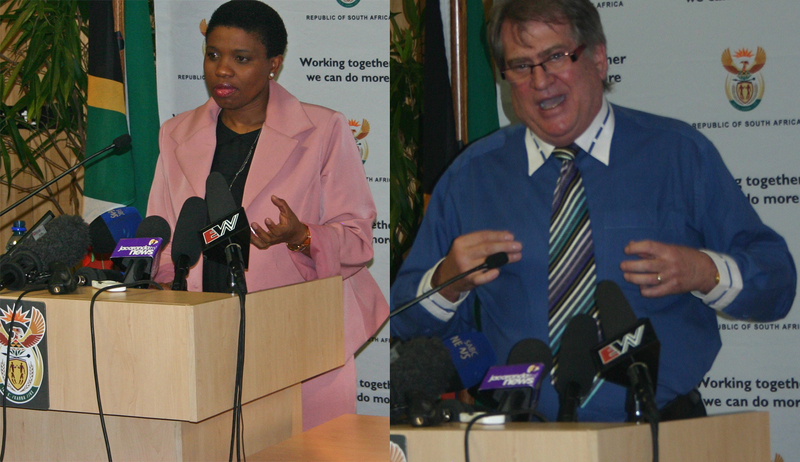 Jiba went to great pains to explain that the initial murder charge was based on “a sound legal principle which has not only been part of our legal system for decades, but continues to remain relevant and applicable in our democratic dispensation.” She read from a prepared statement while standing at a podium in a briefing room, flanked to her left by Willie Hofmeyr (fired by Zuma as the head of the Special Investigating Unit late last year, now head of the asset forfeiture unit); Smit, who peered at the media from beneath his heavily knitted brow; and his side-kick, public prosecutor Nigel Carpenter. Jiba took care to explain that the decision to charge the miners with murder was taken by Smit. “In terms of the NPA Act, Directors of Public Prosecutions are heads of prosecutions in their respective areas of jurisdiction. They are responsible for prosecutions in their respective areas of jurisdiction and they therefore have the legislative mandate to make the primary decisions with regard to the prosecutions,” she said, before clarifying her own role in the matter. “The National Director of Public Prosecutions, in terms of the same Act, has powers to review prosecutorial decisions taken by the Directors of Public Prosecutions after consulting the DPP (Smit) and taking representations from the complainant and accused. “All decisions, including those to add murder charges, were taken by the DPP for the North West, Advocate Johan Smit and members of the prosecutions team,” she added. Jiba’s spin was perfectly on pitch. “I have faith in the prosecutors handling this case,” she told media asking questions, and confirmed the NPA’s independence; saying that the decision to drop charges wasn’t informed by Zuma or anyone else. Things were going well for the NPA until Smit got up from his seat to answer questions about his decision to go for the murder charge, based on the legal principle of ‘common purpose’. But first Smit pointed out that the murder charges related only to the killing of the 34 protesters. “The question of the killing of the other ten people, this is a totally separate issue.” Smit said seven suspects had been arrested for the killing of two policemen prior to the Marikana massacre on Thursday 16 August 2012. One person had been charged with the murder of the two security guards, and no-one had as yet been charged for the murders of the six others in the run up to the police stand-off. And then Smit answered the question about why the murder charge had been made at such an early stage, before all the investigations had been completed. The answer came in many parts, and was almost like a theatrical performance. “As soon as there is evidence in a criminal case, that covers all the elements of an offence, in this instance murder, and the evidence is able to link a specific suspect, with that offence, murder, it is the duty of the prosecution and the prosecutor more specifically, to bring that charge into play by entering it into the court book onto the J15, the charge sheet. The reason for that is very important,” Smit explained, saying this importance had everything to do with ensuring the court had all the information it required when making decisions about bail. This brought an end to act one of the answer, in which Smit declared how thoroughly he was doing his job. “In other words, let me give you a simple example. If I have a murder case, and the accused in the murder case also committed an assault, it will be totally wrong of me only to put the assault case – the lesser charge – on the charge sheet, because then the court, which enquires about bail, will not have the full picture and they come to a wrong conclusion because all the facts are not revealed to them. So it is a duty that the prosecution has,” Smit said in his over-explanation. The question had been more than adequately answered, but given the media fracas about his ‘common purpose’ decision and the political to-ing and fro-ing, it seems Smit just couldn’t resist the urge to explain why the decision for his murder charge against the miners was so “sound”. Basically, he was trying to illustrate how relevant and “sound” the legal dictum was, despite the fact that it was used during Apartheid to net MK cadres for the crimes of their comrades. Smit’s decision to use S versus Lungile and Another is smart, because it follows a 1991 ruling on the ‘Upington 14’ case, where the court ruled that a crowd couldn’t form the intent to kill, and only individuals could. At this point the Afrikaans Smit, who worked in Vryburg as a private attorney, in Kimberley for the Department of Justice in the bad old Apartheid days, and in Bloemfontein as a prosecutor before that, began to roll his ‘rrrrrs’ with guttural relish. “I sound like a boer when I say robberrrrrr – but if I do it differently, it may not come out on the record. I don’t normally speak like this. I just wondered if you can hear me clearly,” Smit played to the crowd, who laughed a little. “In such circumstances, the death of the deceased was factually caused by both the robber and the policeman,” explaining how the robbers were at fault in this instance, even though they didn’t kill the bystander. “Now, the evidence of this case [is] precisely the same,” Smit says confidently. “You have evidence of a group of people who arm themselves to attack the police. The actions of the police will be sorted out still. We are not ignoring that. There is a commission of enquiry. There is a police investigation into that,” Smit said, assuring the journalists the police matter was being dealt with, even though to date it has appeared to to be happening neatly behind the scenes. “The legal principle is very similar, and if you have a look at the evidence that we have available already, it was sufficient, and it was proven, and it was actually desirable for me to put those charges in so that the court may be able to take an informed decision about that. Circumstances have changed in the interim since then, and by Thursday the State’s attitude…changed substantially,” he said, building up to the denouement before his big bow. But then a pesky journalist went and asked a very inconvenient question. “You are citing an example of a criminal in a robbery,” she said, pointing out that the accused are protestors who sat on a mountain for five days without launching any assault on the police. “Where did you get the information they attacked the police? I understand that there was a stand-off, and shooting ensued and people died. But where do you get the facts that they should be charged with murder?” she asked, as Smit desperately tried to interject. By the time she’d finished her question, Smit was livid, and was bearing over the podium. The media erupted into protests; Hofmeyr lifted a writing instrument to pen notes to his peers; and the NPA’s communications head rushed in for a bit of damage control. The dulcet tones returned as Hofmeyr finished scribbling instructions to Jiba et al. The media briefing was contained; last questions were taken. The media was reminded that the NPA was doing them a favour by speaking out, that this government office shouldn’t actually be speaking to the press. That the case is sub judice, that the merits of the case can’t be debated publicly. And with that, the veil was drawn over all the power struggles that brought the investigation, the NPA, and Zuma’s appointed judicial commission of inquiry to this very moment. A fragile moment in history where the world’s faith in South Africa was shaken; where Cosatu’s fractures were exposed; where Zuma’s leadership was (again) questioned; and where hope and faith in justice were lost.